Content is king. If you’re a modern marketer, you know why—it is the fuel for your lead generation and nurturing programs, driving leads through your funnel to become customers.But getting your content machine up and running is tough. 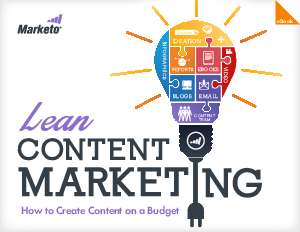 Many marketers, in both large organizations and small, lack the budget, resources, and time to implement a content strategy that can truly drive leads through all stages of the funnel.Luckily, by learning to leverage the resources you already have and doing more with less, even marketers with limited resources can start to create the content needed to fuel demand.